Starting with the German government’s Industry 4.0 high-tech strategy and then extending to the world's most advanced economies, the intelligence trend has become relatively common in manufacturing industries worldwide. Currently, manufacturers around the world have combined sensors, networking technology, big data analytics, machine learning, and other technologies to improve their production efficiency. 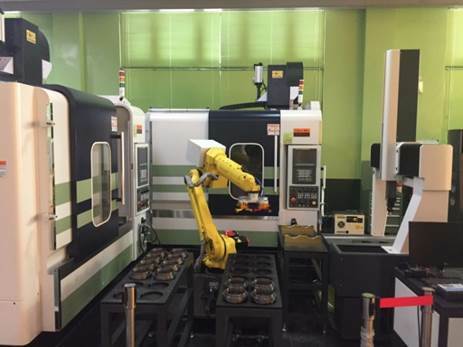 Avex-SG Technology Inc. is a Taiwanese system integrator focusing on machine tool components. This company has cooperated with the world's leading manufacturers of distribution control cabinets. In recent years, it has sought to transform its operations into intelligent processes in order to stay in touch with its customers and the market as a whole. To obtain machine information and increase total added value of production for its customers, Avex-SG has teamed up with Advantech to upgrade its customers’ CNC machine tools from conventional stand-alone controls to networking-type intelligent applications by adopting Advantech’s CNC machine tool networking solution. CNC machine tools are mainly used in metal processing. In Taiwan, metal processing manufacturers mostly receive small-volume, large-variety orders. For every batch order, the parameter settings of relevant machine tools on production lines must be configured, which relies on manual adjustment and management. Each adjustment can take from 1–2 days to even a week. Occasionally, this can lead to production downtime. Manual adjustment is inefficient and has a negative impact on production flexibility. Factory managers are often unable to respond quickly to different orders, thus restricting whether a factory can take on more orders. Consequently, many small- and medium-sized factories can accept production orders only for the same or similar products. Using network-capable CNC machines can solve the problems currently encountered by metal processing manufacturers. Equipment networking allows engineers to remotely upload and download machining files via a network, thus enabling them to adjust the operating mode of a CNC machine remotely instead of having to take a portable storage device to the production site and manually copy the machining program to the machine. In the past, CNC machine production quantities were recorded manually on paper and then input into the management system. Since the advent of equipment networking, the usage and daily production of CNC machine tools can be promptly uploaded to the management system via a network. Factory managers can thus remotely maximize the operational efficiency of CNC machines, thereby reducing machine idle times and realizing the production visualization. Because all information is aggregated on the same platform, the system can automatically generate production and processing traceability reports, meaning that manual records need no longer be maintained. Additionally, analyzing a tool or equipment maintenance/management records to create an equipment maintenance model enables users to prepare materials or perform equipment maintenance in advance instead of replacing parts at the time a fault occurs; this also reduces the possibility of inventory shortages of necessary maintenance parts. Compared with conventional practices that rely on the experience of engineers to make judgments in the field, the former alternative is clearly more efficient and can minimize error rates. Based on the WebAccess/SCADA system, Advantech has introduced WebAccess/CNC, a networking software application designed specifically for the machine tools market. As a networking solution for machine tools, WebAccess/CNC provides networking interfaces for four major CNC controller suppliers (i.e., Fanuc, Mitsubishi, Heidenhain, and Siemens), allowing users to directly collect information from networked CNC machines without having to customize the machines or install a sensor. With its many software functions, WebAccess/CNC can automatically generate reports on equipment status, production utilization, alarm history, machining program management, parameter compensation settings, tool spindle status, and preventive maintenance, thus enabling the visualization of machine information. Users can view this information in real time, not only from the control room but also through mobile devices, thus realizing the full potential of intelligent production management. Most current CNC machine tools are produced by Japanese or European manufacturers, and machines from different brands typically have their own communication protocols. Using closed network architecture to collect and integrate information is both difficult and costly. The most common approach is to install additional sensing devices to obtain equipment information, but this requires removal of the cabinet and some electrical work, both of which can result in long downtimes in order to successfully network the a CNC machine tool. Advantech’s WebAccess/CNC equipment networking solution overcomes the limitations of extant practices. It comes preintegrated with the network protocols of the four aforementioned CNC controller suppliers, giving manufacturers and system integrators direct access to the controller parameters and machine processing information via the software settings. With this approach, it only takes approximately 1 day for CNC machine tool networking. WebAccess/CNC is designed under the WebAccess/SCADA architecture, meaning that it offers the same powerful monitoring and management functions in addition to its flexible configuration and seamless integration capabilities. Supporting various communication protocols also allows users to connect to other industrial equipment (e.g., programmable logic controllers, human–machine interfaces, and I/O devices), enabling complete integration into the same monitoring system. 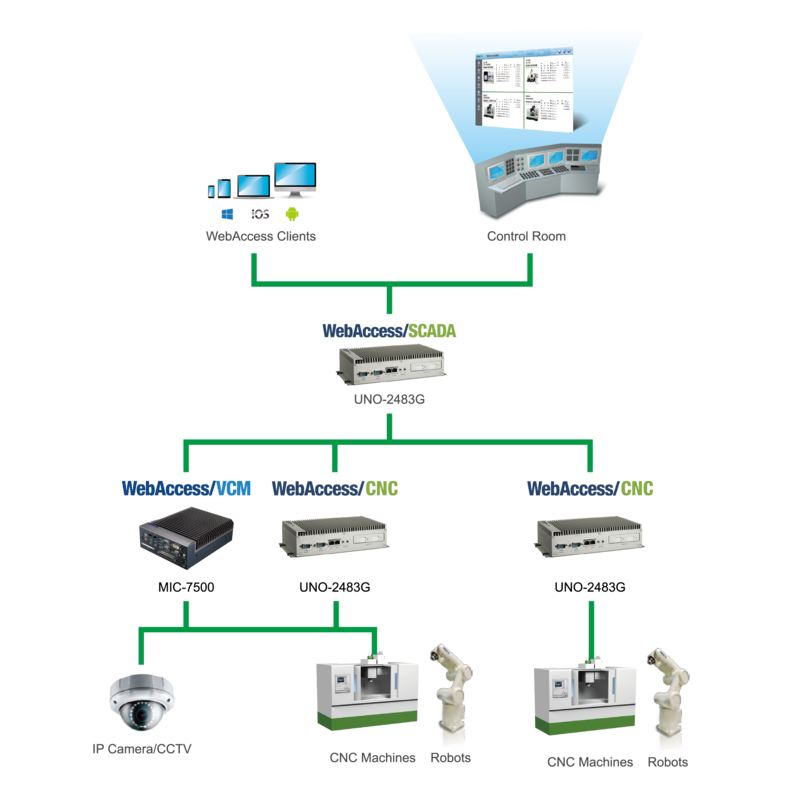 In addition to integrating factory production facilities, WebAccess/CNC can be combined with Advantech’s intelligent video management system, WebAccess/VCM, to enable monitoring production in real time through its built-in intelligent image analysis functions (e.g., unauthorized access detection, motion detection, and camera tampering detection). In response to the trend of intelligent manufacturing, companies operating in traditional manufacturing industries are gradually transforming their operations to accommodate intelligent machinery. Avex-SG has cooperated with Advantech to ensure that CNC machine tools can directly collect relevant information (e.g., machine usage, production process, node status) without needing to install additional sensors. Factory managers can remotely monitor the real-time production status of machines from a computer, tablet device, or mobile phone. Advantech’s WebAccess/CNC provides a software development tool for equipment networking, and Advantech will continue to develop and support major CNC network-type controller manufacturers, helping them easily implement intelligent manufacturing and improve the production efficiency of their customers.